It's time for a guest blogger! Computer programming is a skill that is great for everyone to learn. Not everyone is meant to be a programmer, but computers are so important today that I think everyone should have some appreciation of how they work. So I was glad to have my thirteen year old son try out a product from Computer Science for Kids. Now computer programming is something my family has a fair bit of experience with. My husband and I both have degrees in computer engineering, and my mother was a computer programmer way back in the late 1950s! When my mom programmed she used machine language with ‘1’s and ‘0’s, but luckily there are much easier ways to program now. My son got to try out programming in Basic, with the Beginning Microsoft Small Basic curriculum. This is designed for children ages 10+ as an introduction to a simple, yet powerful programming language. 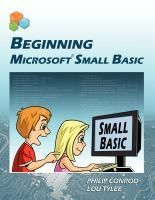 This guide consists of 11 chapters, which consist of over 500 pages, explaining how to build Small Basic applications. Some of the programs that kids will create include a savings calculator, a number guessing game, a card game and simple drawing programs. My son had programmed in Visual Basic, which is a similar language, before. So he found parts of the program easy, especially at the beginning. He finished 8 of the 11 sections during the review period. The designers of the curriculum say you should allow 3-6 hours per chapter, and my son was able to complete them in about 1-2 hours each. But one of the nice things about this program is that it is self-paced, so you can take as long as you need to work through the examples and create the programs. He enjoyed using the program and found it very user friendly. We chose not to print out the guide, since it is over 500 pages long. Instead he read through the pdf in one window and ran the programs in another window. I like the fact that the curriculum covers more than just simple concepts. It introduces arrays and looping, which are crucial for more complicated programs. It also covers graphics, which of course is fun for the kids. Here is a screen shot from the war card game program. 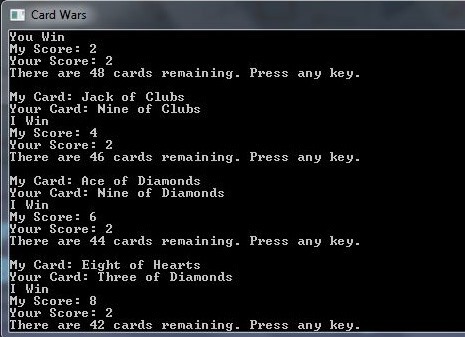 This program requires some relatively complicated data structures to store the card values and shuffle the cards. Understanding how to use variables in arrays is probably one of the harder concepts to learn in beginning programing, so it is nice to see it covered here. 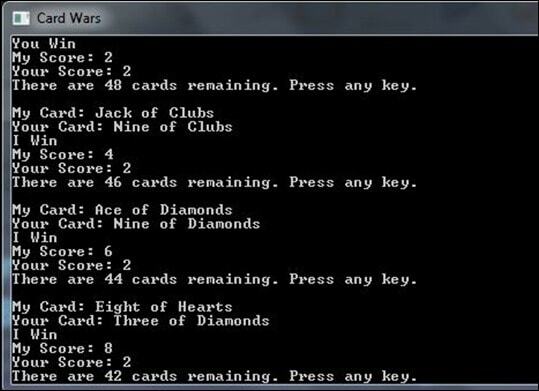 Right now this program only goes through the deck one time, and my son wants to modify it so that it reshuffles like a real war game would. There are lots of suggestions in the book for ways to extend the programs, which are perfect for a child who is motivated. I didn’t have to do much to help my son with this course, although there were a few times where he asked for help understanding the error messages he was getting. We both thought this curriculum provides an excellent introduction to computer programming that isn’t overly difficult for a beginner, but still provides plenty of challenge. Thanks to Phil Conrod and to Anne from Upstate Ramblings!